The Jammu-Srinagar National Highway, the only all-weather road linking the Kashmir Valley with the rest of the country, was re-opened for one-way traffic on Tuesday after remaining closed for a week due to heavy snowfall and incessant rains in the region, officials said. The 270-km-long highway was closed for traffic on last Wednesday following heavy snowfall and incessant rains which triggered avalanches and landslides at various places especially on Qazigund-Banihal-Ramban stretch including Jawahar Tunnel - the gateway to Kashmir Valley. "The breakthrough has been made and the stranded traffic was allowed from Ramban towards Kashmir after seven days," District development commissioner, Ramban Showkat Aijaz told reporters. Mr Aijaz, who was monitoring the road clearance operation at Panthiyal since morning, told the reporters that 300 persons on foot were also allowed to continue their journey towards Kashmir. Earlier Tuesday, Mr Sharma said, the massive landslide at Maroog was cleared but fresh landslides occurred at Anokhi fall, Kella morh and Panthiyal overnight. However, the men and machinery managed to clear the debris from the road by 2:45 PM for smooth vehicular traffic. 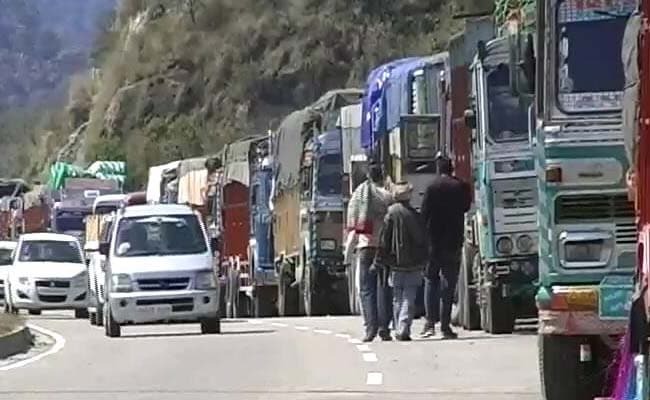 The DSP said that barring this problematic 12-km-long stretch from Ramsu to Panthiyal the road was almost through and nearly two dozen oil tankers and trucks carrying LPG cylinders which were stranded near Maroog proceeded towards Srinagar after the clearance of the landslide on Tuesday morning. Officials said the eastern tube of Jawahar Tunnel, north portal side, which was blocked by a snow avalanche on Thursday, was made traffic worthy on Monday evening. In view of the closure of the highway, the Indian Air Force (IAF) had so far airlifted over 1400 stranded passengers including students since Friday.